Eyesight is one of our most valuable senses. As we age, problems can arise with our vision, that not only impact quality of life, but also safety and independence. 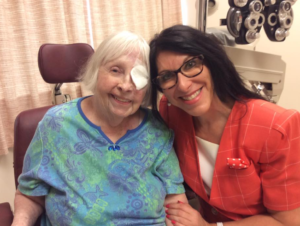 Dr. Lisa Bunin, an Allentown-based eye physician and surgeon has some advice on ways to keep your vision in shape as we get older. LVM: What are some of the biggest issues that occur to our eyes as we age? Dr. Bunin: The first thing that most people notice as they age is that their arms become too short! This is because the lens in the eye becomes thicker and inelastic, so it can’t change shape to focus up close. This is called presbyopia, and usually starts in our 40s and gets worse over time, requiring bifocal or near vision glasses. Also as the lens ages, it becomes cloudy. That’s what a cataract is—a clouding or opacity of the natural lens in the eye. A cataract isn’t a growth or film over the eye, but it acts like it, causing gradual painless changes in our vision, such as needing more light to read, difficulty seeing in dim light, not seeing colors as well, having blurred vision, and noticing more glare. Sometimes these are so gradual that patients don’t notice and think they are seeing well until one cataract is removed and then they realize how bright and clear everything is! Patients are six times more likely to be in a car accident if they have cataracts. Note: Dr. Bunin mentions that eye doctors don’t take cataracts out just because they’re there; but only when they interfere with someone’s lifestyle or if they are getting too hard. She says newer techniques are faster and safer and don’t require stitches. Using high-speed ultrasound to chew up the cataract, there’s no benefit to waiting until the cataract is hard. What are some symptoms that seniors should not ignore in terms of their eyes and sight? Seeing flashing lights or floating spots in one eye (always cover one eye at a time and check if symptoms are in one or both eyes) can be the first signs of a retinal detachment and should not be ignored. If you see a shadow or curtain coming over your vision from any angle, you should consider that an emergency. Severe halos around lights and a bad headache could be signs of acute glaucoma, especially if the vision quickly becomes hazy. Sudden loss of vision of any kind should also be considered an emergency. If straight lines become bent, wavy, distorted, or there are spots missing in your vision, then you could be having a macular problem such as macular degeneration, macular bleeding or swelling (especially if you are diabetic), and you should seek help. What are some of the latest technological advancements that can help seniors see better and solve some of their common eye complaints? We have much better optical materials for glasses and contact lenses, with wider optical zones for progressive lenses, giving better visual correction with less distortion. We have safer, modern techniques for cataract surgery and custom cataract surgery with upgrades to give better quality of vision and more freedom from glasses after cataract surgery. We have much more effective glaucoma medicines with fewer side effects, and microshunts and newer valves and laser treatments for glaucoma so that earlier treatment is safer and more effective at not only slowing but sometimes even stopping progression of the disease. The earlier glaucoma is caught, the better the prognosis for vision. We have much better medicines and injections now for macular degeneration and diabetic eye diseases! Again, early diagnosis and treatment are critical to success, but there is much better success these days! Dry eyes is now understood to be an inflammatory disease, and the answer is not just tear drops! How often should seniors get routine exams? Yearly eye exams are the best way to detect problems early and prevent damage to their vision. What should people know about cataract surgery today compared to years ago? Cataract Surgery has undergone tremendous technological advances since the days of your parents and grandparents. Now cataract surgery is an opportunity for improved vision and a decrease in dependence on glasses! When the cloudy, cataractous lens is removed at surgery, a new artificial lens (intraocular lens implant) is put in the eye to help focus the light. Insurance usually covers only a standard lens implant. The optics are “standard”, much like an older TV or camera. New lens implants with “high definition” optics that focus light more sharply with fewer aberrations are available for an extra charge, as are new lenses and procedures to reduce astigmatism. There are also multifocal lens implants, allowing better vision for distance, mid-range and reading. FYI: Dr. Bunin performed the first multifocal intraocular lens implant in the Lehigh Valley. Are there any cosmetic eye treatments that people over 50 should consider? Absolutely! Eyelid surgery! A droopy, baggy upper eyelid blocks the vision like a window shade blocks the upper view out of a window, and this can really affect visibility driving and parking, and seeing to the side. Eyelid surgery can not only help people to see and feel better, they will look much better! Patients often come for eyelid surgery because they are tired of being told they look tired or angry, but after surgery they realize how much it was affecting their life functions, too!